Newcomer Family Obituaries - Patricia J. Wilson 1930 - 2018 - Newcomer Cremations, Funerals & Receptions. She was born February 16, 1930 in Oshkosh, Wisconsin, the eldest daughter of John and Viola (Kleveno) Leinweber. She spent some of her early years in Basin, Wyoming with her family farming. She graduated from Oshkosh High School, Oshkosh, Wisconsin. After high school she moved to Denver, staying with relatives and attended University of Denver, where she met her future husband, John Wilson. They were married on August 25, 1951 in Wisconsin. In addition to raising 3 children, she worked at various organizations. Early on, it was Avon, where she achieved the ‘Avon President’s Club’. Additionally, she worked at Kaiser Permanente where she retired after 10 years and was awarded Kaiser’s ‘Life Savers Award’. In her spare time, you could always find her in her vegetable/ flower garden or tap dancing with Jan’s Happy Tappers. She loved to travel to California & Wisconsin and spend time with her family, grandchildren & friends. She had a fun, free spirit attitude that everyone enjoyed to be around. Pat is survived by two sons, Jack (Jane) Wilson and Robert (Deb) Wilson, a daughter, Susan (Scott Trigg) Wilson, ten grandchildren, Annie (Franky) Scaglione, Jonell Anderson, Tarryn Wilson, Katie Wilson, Andrew Wilson, Kristen Hurlbut, Kate (Will) Green, Emily (Jason) Kotas, Kelsey Trigg, and Karisa Trigg and four great grandchildren, Marzio, Silvana, Ava, and Sam. She is survived by two brothers, Richard (Judy) Leinweber and Tom (Eileen), and a sister, Claudia Hurlbut all residing in Oshkosh, Wisconsin. She has two nieces, Laurie (Steve) Mierswa and Erin (Steve) Coppernoll and two nephews, Craig (Michelle) Leinweber and Ross (Sarah) Leinweber . To share a memory of leave a message of condolence, please click on the "Share Memories" button above. Add your memories to the guest book of Patricia Wilson. Pat was our next-door neighbor for almost 40 years. We moved in next to her and John in September 1978. They were warm and welcoming to us. Pat was kind and caring and always had a friendly smile to greet us with when she was out watering her front yard. I loved our little talks as she taught me about her flowers and plants. Pat was an animal lover and always took time to talk to and pet our dogs when they ran over to greet her. 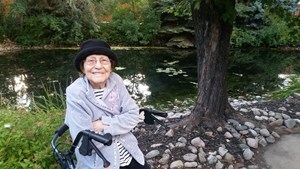 She was a wonderful neighbor and we have missed having her next door since she moved into assisted living one year ago. We will miss her kind and gentle spirit. I met Pat at tap dance lessons. She had such a good sense of humor and was fun to be around. I enjoyed talking to her between our dance songs. I loved her turquoise purse and her turquoise clothes. She came to my house for several Christmas parties and always had us all laughing. I will miss her a lot. She was a great lady. Enjoyed tap dancing with you. You always had a happy smile. Love and memories to your family. Pat was a dear from the time we met as Happy Tappers. When I was a new dancer, Pat always made me feel as though I belonged. Her friendly way made me feel special even during my early days in the troupe. I loved Pat’s enthusiasm, even to the end. Pat came to our parties and even danced with us at her residence. Pat was a crowd pleaser, because she danced with us – and was one of their own (the other residents). They loved seeing her dance with us. Pat, we will certainly miss you. Pat was a wonderful person, always thinking of others before herself. She collected flowers for me for my cards, and we had wonderful long conversations on the phone. She loved to tap dance and it was fun to dance and laugh with her. She will be sorely missed. Truly enjoyed all of Aunt Pat's visits to Oshkosh. She was a blessing to know. She will be deeply missed. Love and kisses to all! pat i were buds when we were little growing up in basin, wy. have been friends ever since. she will be greatly missed. her mother vi was my godmother. love to all the family. andy l.